Some of the most invaluable contributions to literature have come from famous French writers. From the existentialist Jean Paul Sartre to commentary on society offered by Flaubert, France is well known for offering the world a sampling of literary genius. In fact, chances are that you are very familiar with or at least have heard of some French literature by virtue of the many famous French sayings that are quoted from these literary masters. 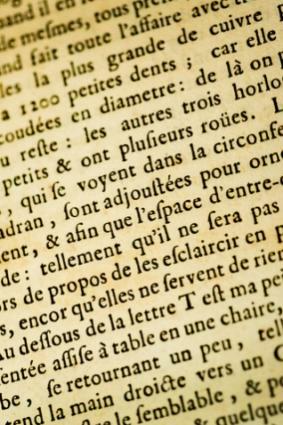 Over the centuries, many great literary works have come out of France. While this list is hardly comprehensive, the following are arguably some of the greatest literary masters that have ever lived. Chances are good that you've read or at least heard of these famous French writers. Balzac was a French novelist and playwright. One of his most famous works, La Comédie Humaine, was his first real taste of success in the literary world. In fact, his personal life was much more about trying things out and failing than seeing actual success. He is considered by many literary critics as one of the "founding fathers" of realism as La Comédie Humaine was a commentary on all aspects of life. It was a collection of all the works that he penned under his own name. Le Père Goriot is often read in French literature classes as a classic example of realism. The story of King Lear set in 1820's Paris, Le Père Goriot is Balzac's commentary on a society who loves money. Samuel Beckett is actually Irish, however, he did his writing primarily in French and after spending time in Paris, moved there permanently in 1937. He is considered the last great modernist and some would argue that he was the first post-modernist. Particularly notable in his personal life was his work with the French Resistance during World War II while under German occupation. While Beckett published prolifically, he is perhaps best known for the theatre of the absurd and in particular his play, En attendant Godot, (Waiting for Godot). Cyrano de Bergerac is actually best known for a play that was written about him by Rostand entitled Cyrano de Bergerac. The play has been adapted to screen many, many times. The plot is well familiar: Cyrano loves Roxanne, but ends up wooing her using his poetry on behalf of another friend who is less articulate. Rostand apparently embellished the real life characteristics of de Bergerac although apparently he really was a phenomenal swordsmen, and a greatly admired poet. Arguably, his poetry is more well known because of Rostand's play. He also reportedly had an enormously large nose of which he was very proud. Albert Camus was an Algerian born author who won the Nobel Prize for Literature in 1957. He was the first African born author to do so, and he was the second youngest writer to do so in literary history. Despite being linked to existentialism, Camus rejected any such label. He is best known for two novels of the absurd L'Étranger (The Stranger) and Le Mythe de Sisyphe. He was perhaps best known as a philosopher and his works certainly reflected his commentary on life at the time. He actually aspired to be a football (soccer) player, but he contracted tuberculosis at the age of 17 and was confined to bed for long periods of time. Victor Hugo would describe himself first as a humanitarian who used literature as a means to describe the human conditions and the injustices of society. Both of these themes can easily be seen in what are perhaps his two most famous works: Les misèrables (The Miserables. . .but generally referred to by its French name), and Notre-Dame de Paris (referred to by the popular title, The Hunchback of Notre Dame. His first published novel, Madame Bovary, was perhaps his most well known work. It was originally published as a serialized novel, and the French government consequently brought a suit against Flaubert for immorality. He is also well known for his very close and probably amorous relationship with George Sand. Literature, has been and continues to be a moving force behind philosophy in France. Paris has arguably been the foremost breeding ground for new ideas, philosophies and movements that the world has seen.